George Chapline believes that the Event Horizon Telescope will offer evidence that black holes are really dark energy stars. NASA. What does the supermassive black hole at the center of the Milky Way look like? Early next year, we might find out. The Event Horizon Telescope—really a virtual telescope with an effective diameter of the Earth—has been pointing at Sagittarius A* for the last several years. Most researchers in the astrophysics community expect that its images, taken from telescopes all over the Earth, will show the telltale signs of a black hole: a bright swirl of light, produced by a disc of gases trapped in the black hole’s orbit, surrounding a black shadow at the center—the event horizon. This encloses the region of space where the black-hole singularity’s gravitational pull is too strong for light to escape. But George Chapline, a physicist at the Lawrence Livermore National Laboratory, doesn’t expect to see a black hole. He doesn’t believe they’re real. In 2005, he told Nature that “it’s a near certainty that black holes don’t exist” and—building on previous work he’d done with physics Nobel laureate Robert Laughlin—introduced an alternative model that he dubbed “dark energy stars.” Dark energy is a term physicists use to describe a peculiar kind of energy that appears to permeate the entire universe. It expands the fabric of spacetime itself, even as gravity attempts to bring objects closer together. Chapline believes that the immense energies in a collapsing star cause its protons and neutrons to decay into a gas of photons and other elementary particles, along with what he refers to as “droplets of vacuum energy.” These form a “condensed” phase of spacetime—much like a gas under enough pressure transitions to liquid—that has a much higher density of dark energy than the spacetime surrounding the star. This provides the pressure necessary to hold gravity at bay and prevent a singularity from forming. 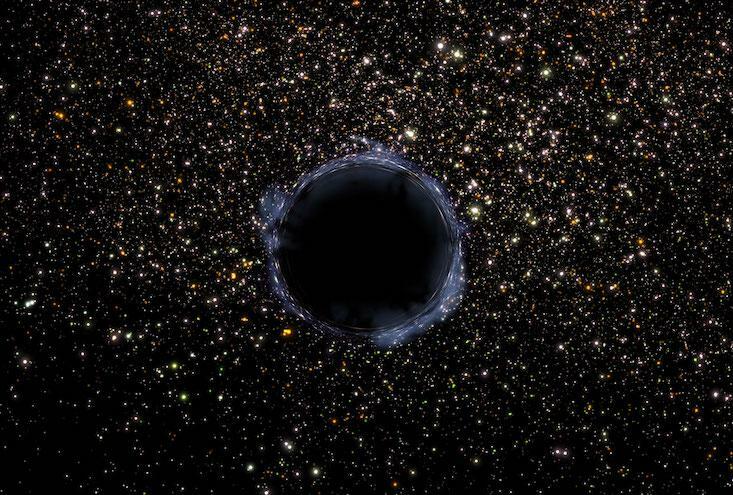 Without a singularity in spacetime, there is no black hole. The idea has found no support in the astrophysical community—over the last decade, Chapline’s papers on this topic have garnered only single-digit citations. His most popular paper in particle physics, by contrast, has been cited over 600 times. But Chapline suspects his days of wandering in the scientific wilderness may soon be over. He believes that the Event Horizon Telescope will offer evidence that dark energy stars are real. The idea goes back to a 2000 paper [International Journal of Modern Physics A], with Evan Hohlfeld and David Santiago, in which Chapline and Laughlin modeled spacetime as a Bose-Einstein condensate—a state of matter that arises when taking an extremely low-density gas to extremely low temperatures, near absolute zero. Chapline and Laughlin’s model is quantum mechanical in nature: General relativity emerges as a consequence of the way that the spacetime condensate behaves on large scales. Spacetime in this model also undergoes phase transformations when it gains or loses energy. Other scientists find this to be a promising path, too. A 2009 paper [Physical Review A] by a group of Japanese physicists stated that “[Bose-Einstein Condensates] are one of the most promising quantum fluids for” analogizing curved spacetime. Chapline and Laughlin argue that they can describe the collapsed stars that most scientists take to be black holes as regions where spacetime has undergone a phase transition. They find that the laws of general relativity are valid everywhere in the vicinity of the collapsed star, except at the event horizon, which marks the boundary between two different phases of spacetime. In the condensate model the event horizon surrounding a collapsed star is no longer a point of no return but instead a traversable, physical surface. This feature, along with the lack of a singularity that is the signature feature of black holes, means that paradoxes associated with black holes, like the destruction of information, don’t arise. Laughlin has been reticent to conjecture too far beyond his and Chapline’s initial ideas. He believes Chapline is onto something with dark energy stars, “but where we part company is in the amount of speculating we are willing to do about what ‘phase’ of the vacuum might be inside” what most scientists call black holes, Laughlin said. He’s holding off until experimental data reveals more about the interior phase. “I will then write my second paper on the subject,” he said. In recent years Chapline has continued to refine his dark energy star model in collaboration with several other authors, including Pawel Mazur of the University of South Carolina and Piotr Marecki of Leipzig University. He’s concluded that dark energy stars aren’t spherical or oblate, like black holes. Instead, they have the shape of a torus, or donut. In a rotating compact object, like a dark energy star, Chapline believes quantum effects in the spacetime condensate generate a large vortex along the object’s axis of rotation. Because the region inside the vortex is empty—think of the depression that forms at the center of whirlpool—the center of the dark energy star is hollow, like an apple without its core. A similar effect is observed when quantum mechanics is used to model rotating drops of superfluid. There too, a central vortex can form at the center of a rotating drop and, surprisingly, change its shape from a sphere to a torus. For Chapline, this strange toroidal geometry isn’t a bug of dark energy stars, but a feature, as it helps explain the origin and shape of astrophysical jets—the highly energetic beams of ionized matter that are generated along the axis of rotation of a compact object like a black hole. Chapline believes he’s identified a mechanism in dark energy stars that explains observations of astrophysical jets better than mainstream ones, which posit that energy is extracted from the accretion disk outside of a black hole and focused into a narrow beam along the black hole’s axis of rotation. To Chapline, matter and energy falling toward a dark energy star would make its way to the inner throat (the “donut hole”), where electrons orbiting the throat would, as in a Biermann Battery, generate magnetic fields powerful enough to drive the jets. Chapline points to recent experimental work where scientists, at the OMEGA Laser Facility at the University of Rochester, created magnetized jets using lasers to form a ring-like excitation on a flat surface. Though the experiments were not conducted with dark energy stars in mind, Chapline believes it provides support for his theory since the ring-like excitation—Chapline calls it a “ring of fire”—is exactly what he would expect to happen along the throat of a dark energy star. He believes the ring could be the key to supporting the existence of dark energy stars. “This ought to eventually show up clearly” in the Event Horizon Telescope images, Chapline said, referring to the ring. 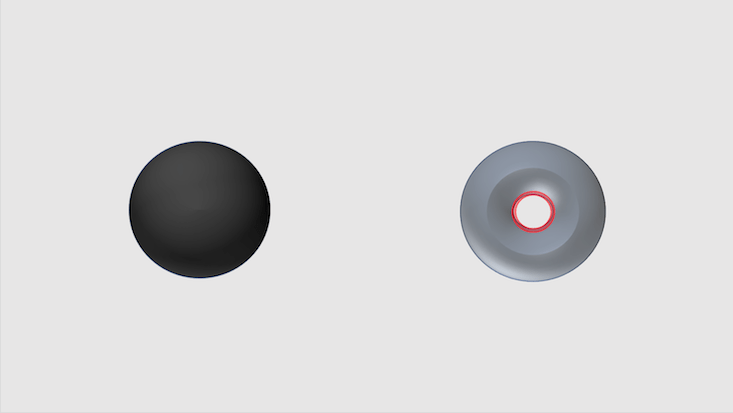 Black hole vs dark energy star: When viewed from the top down, a dark energy star has a central opening, the donut hole. Chapline believes that matter and energy rotating around the central opening (forming the “ring of fire”) is the source of the astrophysical jets observed by astronomers in the vicinity of what most believe to be black holes. No image credit. Chapline also points out that dark energy stars will not be completely opaque to light, as matter and light can pass into, but also out of, a dark energy star. A dark energy star won’t have a completely black interior—instead it will show a distorted image of any stars behind it. Other physicists, though, are skeptical that these kinds of deviations from conventional black hole models would show up in the Event Horizon Telescope data. Raul Carballo-Rubio, a physicist at the International School for Advanced Studies, in Trieste, Italy, has developed his own alternative model to black holes known as semi-classical relativistic stars. Speaking more generally about alternative black hole models Caraballo-Rubio said, “The differences [with black holes] that would arise in these models are too minute to be detected” by the Event Horizon Telescope.